Home » News » The Voyageurs Cup: Now With Extra CanCon! 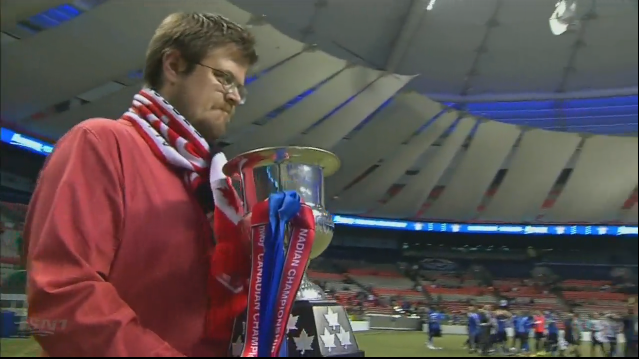 The Voyageurs Cup: Now With Extra CanCon! Always a good time to use that photo. In a move to get more Canadian into the Canadian Championship, each team must include at least three Canadian players in their starting lineup for each game. Next year the winning teams from League1 Ontario and Première Ligue de soccer du Québec will be included in the tournament. And as noted above, should Toronto FC not win the Voyageurs Cup this year, they will have to play the winner (at BMO Field), in a one-off game to determine who goes to the 2018 Concacaf Champions League. The first two points are both positives; Canadian players getting more playing time is always a good thing (Ashtone Morgan this is your time to shine! ), and getting the lower leagues involved next year is fantastic news. Proponents and supporters of the (still in name only) CPL may be wondering why there’s no mention of including teams from the new league in the competition (though surely that must be in the works). I’ll speculate that since the league hasn’t yet been officially formed, the CSA is reluctant to give them a placeholder spot, for now. However should things change in the near future, I’d imagine that they’ll do everything they can to include team(s) from the new league. However let’s look at that last point a little more shall we? On one hand it’s hilarious, and just crazy enough to keep the randomness of the VCup going for another year. On the other hand…what the hell?! Toronto FC won the Voyageurs Cup (and Will “Legend” Johnson broke his leg), which gets you a spot in the Concacaf Champions League, and yet they don’t advance?! To say that this is frustrating is an understatement – I don’t see how fans, and the team itself, can be anything other than angry at this development. It feels like a wasted year (or wasted games, minutes, broken leg, and so on) for Toronto FC – did the CSA and TFC know about this when the CCL changes were being put into place? I would love to hear some further clarification or explanation from the CSA on this, and hope that they do so in the coming days. I look forward to when this tournament has grown into something that is a little more immune to such randomness. The other thing to note or takeaway from this year’s Voyageurs Cup is that it adds two additional games to an already packed May for TFC. Between the last weekend in April (the 28th) and the first week in June (the 3rd), Toronto FC already have eight games (six in May alone) – the addition of the two Voyageurs Cup games will mean ten games in five weeks for TFC. Now more games means a lot of squad rotation and on the bright side it means lots of minutes for Canadian and fringe players, on the less than positive side it means a team stretched thin for an extended period of time. However, it is early(ish) in the season, and far enough away from the break for the Gold Cup that the team should have lots of available players, and not dealing with the fatigue that a long season brings. Other than all of the wackiness I’m excited for Voyageurs Cup games; they are among some of my favourite memories as a TFC fan and I genuinely look forward to the competition each year. The vibe is different for VCup games, it helps to add to the rivalry between the Canadian clubs, it more often than not a chance to see some of the Canadian kids from the reserve or PDL teams, and damn it they’re just fun! So another year of Voyageurs Cup silliness is about to begin – see you in May. They are my favourite games of the year too! Always hoping to see either Ottawa or FCE knock out TFC in the semi. They’re a lot of fun aren’t they? It’ll be even better when we slowly get to add more teams. Last thing I want to see is a team win the Voyageurs cup without any Canadians on their squad. This will not happen now. Yay! Agreed! I think it’s a great change – can’t forget seeing Jordan Hamilton shine in the VCup last year. I know all you guys at Vocal Minority Tower(s) have a special affection for the photo at the top of this article. I welcome the rule addition regarding the Canadian content, but my head is starting to hurt about the CCL qualification criteria. It is as if the NBA is now running the VCup and CCL. It’s one of the most magical pictures ever. We have to pay homage whenever possible. Hey now….leave the NBA out of this – they’d never tell a tournament winner that they weren’t qualified for another tournament! Yeah CONCACAF (and maybe the CSA?) have really kind of messed this one up – they’ve basically invalidated TFC’s VCup win from last season (can only imagine how Will Johnson feels!) – hopefully TFC win this year and make it a moot point. I’d almost be tempted to play all kids/depth in the tournament based on this rule change. Save our top guys for MLS play and then take our chances in the one off championship. I get the desire to do that – and they more or less did that last year – but with Bill Manning in charge there is at least a desire to do well in the CCL. However May is jammed for TFC, so it’s very likely that we’ll see mostly bench players and the requisite Canadian players during those games.